1st Saturday of the Month | January - March, 2019 | 10 PM - 1 AM | DiVino North Augusta Doors open at 10pm with a FREE BEGINNER SALSA CLASS, hors d’oeuvres, full bar, Dj set and so much fun! 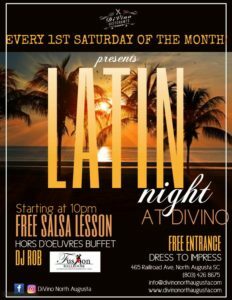 Don’t miss our LATIN NIGHTS every FIRST SATURDAY of the month! In collaboration with FUSION BALLROOM of Augusta. NO COVER! Visit the Facebook Event Page HERE!